All types, Key West bike rental including tricycles, adult trikes, tandems, Key West cruisers, plus kids bicycle rental Key West FL, best price! Rent adult 3 wheel bike tricycles! $40 all day plus overnight to close following day. $20 per day after that. We offer the best prices, free helmets, locks with integrated chains, lights that don't need batteries, baskets on the bikes to carry whatever you need and safety bells for traveling fun in Key West! Call owner Tom Theisen today for multi- day discounts and great group rates to rent bikes in Key West. 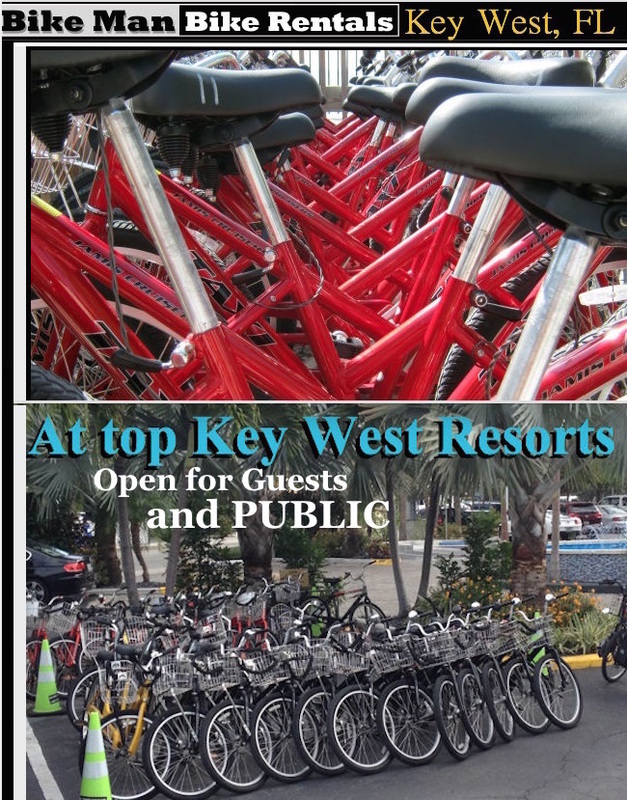 Rental bikes located easily at some of the best Key West resorts. Rent bikes in Key West, all styles, locations, all over the island, best price in Key West bicycle rentals, great service. Get on a bicycle today, it's probably the most fun and easiest way for getting around Key West. Bicycles by the hundreds waiting for you! Rent tennis rackets in Key West too for more fun on the island! The most energy efficient bike service, and greenest company for bicycle rentals Key West FL has to offer. Key West bike rental for kids and adults. Pure fun in Key West.